The yo yo quilt pattern is about as simple a pattern as you can find. But it is also extremely time consuming assembling it. 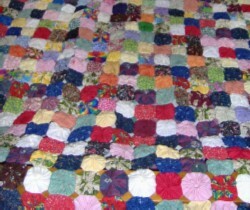 There is no backing to this type of quilt nor is there any quilting stitches. It is a simple matter of connecting the pieces you make. You make this entirely by hand, the sewing machine is not used for any part of this top. This pattern was very popular in the 20s and 30s and some in the 1940s. After that it seem to go by the way side in popularity. You still see in every now again but very seldom do you see one at a quilt show. This quilt has a 3 dimensional effect when completed. You can make it in a crazy patch style for the colors or assemble the colors in a appealing fashion of light and dark. One advantage to making this quilt pattern is you can use up all those small pieces of left over fabric you have. The great thing about this quilt is it can be made “on the go”. It is worked in small circled that are stitched around the edges and than pulled tight to make a sort of disc. The sewing stitch that is used is the large stay stitching. You don't want them tight as you will use these to gather the circle. These are all done individually and than sewn together for the completed quilt. The circles can fit in a small bag and you can carry them anyplace you have to wait, all you need is the circle, needle and thread. 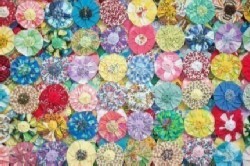 The quilt pattern is made up entirely using these small circles of fabric. You will make a running stitch (stay stitching) around the outside edge of each circle. Than you will “gather” or pull the thread tight to the center. The raw edges will be pulled together to the center. That is all you do to make a yo yo but remember you will need to make a lot of them to make up a quilt. The quilt is not the only thing these can be used for. 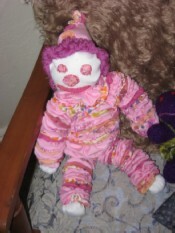 They can be assembled for pillow tops, decorate clothing and even make toys. 3 - Thread your needle leaving a large knot at the end. 8 – Make a couple of stitches at the gathered area to secure yo yo. Now you have the beginning of a quilt. When you complete all the circles you will want to attach them on each side with a few stitches.